Representing schools from Ipswich, Chelmsford, Brentwood & Havering, 7 of our members travelled to Bristol for the 2010 National Schools Finals. Coopers Coborn & Company School from Upminster had Susanna Badley & Lucy Phillips competing as individuals and, joined by Ellie Guy & Emma Brereton, had also won through in the team competition. Brentwood School had Fiona Humphries also competing as an individual, joining the Cooper's girls in the Under 13 Novice category. The remaining two entries were young Maddison Merrit from Downham CoE Primary in the under-11 Novice and Charlotte Webb from Keswick High School in the under 15 Elite. 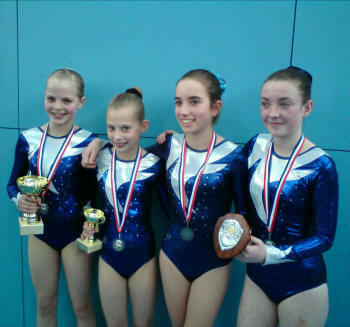 Previous rounds had been held at Harlow (Regional) and Nottingham (Zonal) which saw Susanna, Fiona and Lucy taking 1st, 2nd, 3rd both times, the Cooper's team & Maddison winning and Charlotte winning Regional and 2nd placing in Zonal. Coming up against the best from all four zones it was always going to be an uphill struggle to repeat this performance but, as the detail results show, the girls came close. Susanna & Lucy maintained their 1st/3rd placings but Fiona, unfortunately, slipped down the order as did Maddison in her group. The Cooper's team narrowly missed winning the team coming 2nd whilst Charlotte took 3rd place.